Well, it is official. These are my favorite cookies. Ever. I know that is a bold statement. But stick with me and let me explain. Basically what I mean is that while I love many types of cookies (and I’m talking many), if you nailed me down to one classic cookie that I could eat over and over and not tire of, this would be it. One indication these cookies were elevated to such a high status was that I couldn’t stop opening the freezer and swiping a few from the freezer bag I plopped them into after baking. I’m not talking one or two cookies. I’m talking LOTS of cookies over a small amount of time. It was pathetic…and dangerous to my lingering baby weight. But I threw caution to the wind and overdosed on these babies – and I still wanted to make them again the next day. These cookies come from my Aunt Marilyn. I’ve made them at least a dozen times (and made a few slight changes over the course of making them) but had taken a hiatus from making them for a while and when I made them again last week, I realized I can’t go that long without making them again. So if you like a perfect combination of chocolate, oatmeal, buttery goodness and a slight hint of coconut, you’ll love these. They are chewy and full of texture and deliciousness. Preheat oven to 350 degrees. Put the top 4 ingredients into a food processor or blender and blend about 30 seconds until coarse. Set aside. In a large bowl, beat the butter for 30 seconds until light in color. Add the sugar, eggs, and vanilla. Next, add the dry ingredients then add the coconut and chocolate chips. Shape cookie dough into balls and place on cookie sheet. Bake for 12-13 minutes. Let the cookies cool slightly before removing them from the pan to a wire rack. Makes about 2 dozen cookies. I have made some small tweaks to this recipe to make it a little lower in sugar and carbs, and it comes out really good. Small tweaks, but that allows a yield of 42 cookies, 102 calories each, 4g fat, 14g carb, 7g sugar, and 2g of protein. For a delicious cookie with no fake ingredients that doesn’t compromise on taste, this is on the top of my list. I have this recipe along with 2 others that I use every week. Thank you for sharing! I think I made these a long time ago and forgot about them, but wow! They’re amazing! My daughter and I had a craving to make treats yesterday. Because we’ve learned they turn out better with exact weights, for anyone else wondering (and my own future reference), these are the weights, which we determined by converting from other Mel recipes. Coconut: we couldn’t find a weight for coconut on Mel’s site, and online the weights for 1 cup varied widely. Take your best guess. For the record, the cookies were AMAZING. As in, dangerous to keep around. Thanks for another winner! Glad you love these, Alicia – and thanks for the weight measures. It’s about time I updated this recipe with that info! (And probably new pictures too). Hello! I’ve just read some of the comments below, and you mentioned using sweetened shredded coconut. I bought unsweetened, and I’m baking them this evening. Do you think the unsweetened will work, or should I add something? Or just go back to the store for the sweetened stuff? Yes, unsweetened will work just fine! These are soooo wonderful. We stumbled upon a variation that is fantastic if you need a coconut substitution. Heath toffee bits are perfection in this recipe. They add that bit of crunch similar to coconut and the toffee is wonderful with the oats and brown sugar and everything. Thanks for a great recipe! I would love to try this recipe (as I’ve tried so many of your recipes before and all of them turned out great!) BUT my son hates coconut. I know, I could just make other cookies (like your favorite chocolate chip cookies or the s’mores cookies – they are great!) but I trust your judgement: If these are your favorite cookies, they will be the greatest! So – can I just skip the coconut and try them as coconut-free coconut cookies? Or will this destroy the whole work of art? Hi Anna – I think leaving out the coconut will probably work…the flavor will be different but still yummy. However, they may flatten because the coconut is missing so you might want to up the oats just a bit. Good luck if you try them! Thanks for your advice. Meanwhile I’ve considered to replace the the coconut with grounded almonds. I will try the recipe on the weekend (first things first: today I’ll try the new toffee cookie recipe and I will end up with 200 pounds at Christmas!) and let you know! So how did the recipe work out for you with the almonds. I’m thinking I may try it subbing walnuts for the coconut. These were so good! I’m not a great baker but even I was able to handle this amazing recipe. I found myself eating them and had to give hem to neighbors in an effort to not pack on the ponds. I think these would also be good with raisins or dried cranberries added. Thanks for the recipe. Two things about this recipe. One it’s become my favorite cookie recipe and have made it lots of time since you posted a while back. My problem is if we don’t eat them right up like in a day or so, they start to get hard and that’s not how my hubby likes them. While eating a bunch of cookies would be nice, my hips won’t take it for very long and I like to have a treat last a little longer than a few days if possible. My girlfriend loves this recipe also and has made these too! Hey Linda, I always freeze the baked and cooled cookies! They defrost great and are almost as good as fresh. I store my cookies in a Tupperware with a slice of bread. Works like a charm. Throwaway the bread when the cookies are gone. Hi! I’m sorry if this sounds dumb but what type of coconut do you use? I have desiccated coconut and coconut flakes. I assume you don’t use coconut oil nor coconut milk for this recipe. Thanks! Hi Joanna, I use unsweetened or sweetened shredded coconut. Hey Mel. You have been my go to for all recipes for about 5 or 6 years now. Thanks for all you do! I can’t believe that I haven’t tried this recipe yet, but I do have a question (it may be a silly one). After you beat the butter, it says “add” the other ingredients; to clarify – I do not need to “beat” anything but the butter, correct? Do I just hand mix everything else? Or do I hand mix the butter too? It may be a silly question, but I am very “by the book” and have a very hard time “winging it.” Thank you! Hey Rayna – after I add the other ingredients, I mix on low (if I’m using a handheld electric mixer or using a stand mixer). You could also use a wooden spoon. Does that help? These cookies are delicious! Even when you run out of AP flour so have to use almost half white whole wheat. And when you only have half a bag of mini chocolate chips! I’m not the biggest coconut fan (texture thing) so I used 3/4 of a cup and I felt it was just right. Next time I might add some chopped walnuts because I’m crazy like that. Delicious, love the oatmeal flavour, but the texture is more like a regular chocolate chip cookie. So so good! I only had light brown sugar, so I added about 1/2 tablespoon (eyeballed it) of molasses to try and mimic dark brown. Absolutely delicious! Thanks! 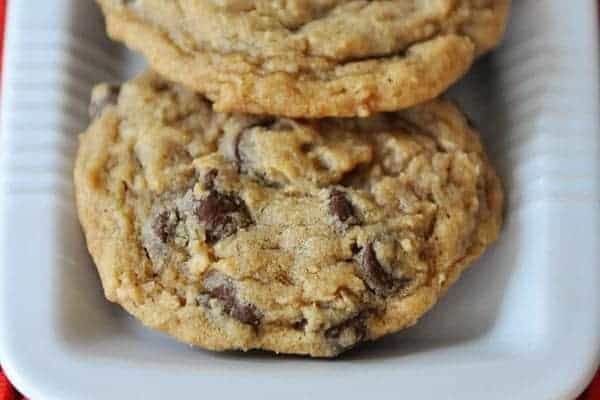 My family’s favorite chocolate chip cookie recipe!!! These are amazing when the dough is frozen and then baked. They are puffy and chewy and delicious all at the same time! I’m so happy you love these, because they continue to be one of my favorite cookies ever! There are SO good. I made them last night and had a hard time not eating the whole bowl of just the dough! YUMMY– is not a strong enough word. Think of an Almond Joy candy bar in a cookie. Can I convert this into a bar cookie somehow to save on baking time?? My husband and I lovvvvvvve these, and I am looking for a shortcut! I haven’t tried that, Ann-Marie – but it should work pretty well! Mel, I am seriously so obsessed with these cookies! I made them a couple months ago and have probably made them 10 times since. I have told my husband several times that if I had 3 wishes, I would honestly use 1 of them to make the calories in these not count because I can put away an embarrassing number of them 🙂 Thanks for your wonderful blog, I use it several times every week and I can always count on the recipes being delicious! Haha, you are so cute! Hi Melanie! I tried baking these cookies and they ARE delicious, but I wonder if you can give me any hints for baking them at high altitudes? Mine didn’t flatten out and weren’t particulary chewy, although still delicious! I normally have to add a little flour to my recipes but I don’t want to make these cookies drier. Any suggestions?? If they didn’t flatten, it sounds like the dough was over floured. How do you measure your flour? I plan on about 5 ounces (weight) of flour for each cup and I fluff up the flour really well, scoop in the cup, and level off. These cookies are AH-MAZING!!! My daughter requested them for her birthday instead of cake!!! These are fantastic! Thank you! I’ve made the recipe as written in the past. Today I made only 1/4 recipe (I know!). My oldest is about to start kindergarten (waaah! ), and I decided I want to have mini cookies for his lunches on Fridays, or special occasions. I used mini m&ms in place of chocolate chips and omitted coconut. It made about 24. I didn’t even dirty the mixer, just used a spatula and a bowl. Just in case anyone else wants mini size cookies: They turned out about 2 inches in diameter (perfect for my needs). I rolled them into balls about 1 teaspoon in size. Baked 7-8 mins. They are perfect. Thanks again for the fantastic recipe! They are so yummy. Oops – I mean they turned out the size of a silver dollar or just slightly bigger. Love the idea of mini cookies, Trisha! did you use dessicated coconut? I usually use sweetened, shredded coconut. Depends on the size but probably right around 2-3 dozen. Will it make too big a difference if I use all light brown sugar? You can definitely do that – the cookies will be just a little lighter in flavor and chewiness. These cookies are awesome! The oats and coconut are a great combo! How did your cookies flatten? Mine are mounds. How large did you roll the balls of dough? Thanks. Sounds like maybe there was to much flour in the cookie dough (if the flour gets packed into the measuring cup, that can happen). I use a couple tablespoons of dough for each cookie. This recipe calls for oatmeal. Do you actually mean oatmeal or oats? Good question – it’s oats. I’ll change it so it isn’t confusing. Yum! 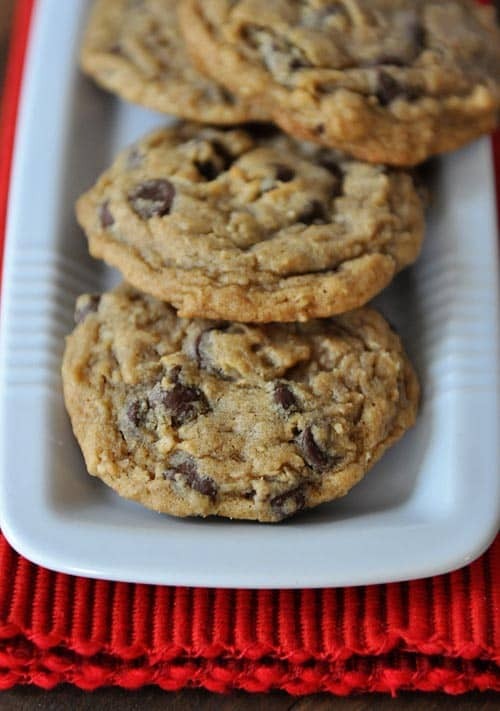 Definitely better than regular chocolate chip cookies. These were perfectly delicious! I got over three dozen out of them too with a normal cookie scoop (2 T size). I wish I got six dozen! Next time I’ll be doubling! Hey Mel – have you ever made these without blending/processing the first four ingredients? My kitchen stuff is all packed up but these cookies sound so good I’m considering trying to mince the oatmeal! Haha. I haven’t – but it’s definitely worth a try! First off, please know that I am one of your BIGGEST fans and have tried a lot of your delicious recipes. I am just about to make these awesome cookies but wanted to ask if you would ever consider adding weight measurements to your baking recipes. This would avoid many subscriptions weighing their flours wrong, which I bet you can attest to happens a lot. I know it would be extra work for you and your sister, but think about how many more fans would join your site (not that you need more fans I’m sure) because they were successful in duplicating the finished product – just like you. Sorry Mel…..I should have clarified, eg. 1 cup of flour is 120 grams. Hi Nancy – thanks for your comment! I agree that weight measures are definitely more foolproof. I try to add them to all my recent baking recipes but some of my older recipes don’t have them yet. It’s not quite as simple as going through and just typing in the weight from the cup measure I’ve already given mostly because I use 5 ounces/142 grams of flour per cup as my standard since I’ve never been able to scoop a cup of flour that only weighs 4 ounces/120 grams – it’s just not enough flour to fill the cup and I want the recipes to work for people that are weighing and measuring, if that makes sense so usually I’m updating the weights as I actually remake the recipes. Anyway, I’m glad to know others use their kitchen scales and know that I’m working on it behind the scenes slowly but surely. Since everyone measures flour differently, I try to refer people to my tip on measuring flour – then at least they know how the flour is measured in the recipes on my site (unfortunately that doesn’t mean a recipe on another website will have flour measured the same weigh – which brings us back to the point that ultimately weight is the way to go). Thanks! My friends LOVE when I bake for them. I made these cookie today, it trued out Amazing…. I didn’t put “white sugar in the cookies. I decided to put the cookie dough in the fridge for 1 hour. What a difference!! Just sayin… 6 months pregnant… and a scoop of vanilla ice cream sandwiched between two of these perfect cookies just made my night! Thanks Mel! I’ve tried probably over 20 recipes on your sight, and you never fail. Why do you put the dry ingredients in a blender before adding to the dough? It seems like I’ve lost the oatmeal texture by doing that. They aren’t meant to be like a classic oatmeal cookie – the blended oats give flavor but a smoother texture. Hi Anna Elle – I love the taste of the vanilla in this cookie (the full 1 tablespoon) but you could always start with 1-2 teaspoons and see how that works for you. Wonderful!! A staple around our house for school lunches. Thanks for another amazing recipe!! Just found you and made these today..We love them..keepers..thank you..
Mel ~ I was curious if you would recommend sweetened or unsweetened coconut. I’m not a big coconut fan but would be willing to try it. I just wanted to make sure using unsweetened coconut wouldn’t affect the outcome of the overall taste? Jennifer W – If you have unsweetened available, I suggest that (it’s what I use when I can find it), otherwise sweetened works just fine, too (obviously makes the cookies just slightly sweeter). I Love using coconut oil to make cookies, but this time of year with all the humidity, I find that my nice crisp cookies turn into mushy, way to soft globs very quickly. Any guidance on how to overcome this? This cookies are amazing!! I have been looking for a good chewy oatmeal type cookie forever. I made mine with all light brown sugar and I refrigerated my dough for a bit. I think it helped to make them thicker. Love these!!! Will make again. I did the same thing put my cookie dough in the fridge. 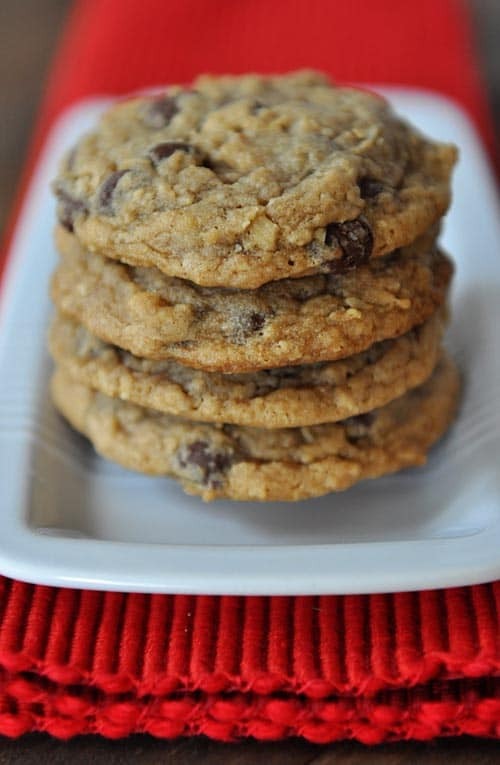 I’m looking for an oatmeal raisin cookie recipe…..not for me, but for my husband. I think chocolate chips is the way to go. Do you think this recipe would work with raisins instead of the chocolate chips? Or do you have a better suggestion? Valerie – These Classic Oatmeal Chocolate Chip Cookies would be a good fit for raisins (and possibly a touch of cinnamon). Good luck! Dear Mel, I came across your blog the other day when looking for a healthy banana muffin (by the way i made them and LOVED them). Today I tried this cookie, but they re way too sweet for my taste (and i only used 1 cup of light brown sugar). Also the batter was rather “hard”, so I did make the balls and then pressed them flat. I gather they should have spread by themselves? (i also left out the coconut, since i wasn’t sure my daughter would like it). i have no expereince with making a CHEWY cookie and have been looking for a recipe for a while — could I inspire you to come up with a healthy version of this one ? For Easter i wanted to make your “Carrot Sheet Cake”, but now i am afraid it will be be too sweet — based on the idea that i love you “health muffins” how much sugar can i leave out when making the cake?? I also wanted to complimento you on the food photograpy and style of the websited — all the recipes simply look mouthwatering and i shall try many more!! As for the carrot sheet cake, again, I don’t think it is too sweet but you could definitely cut the sugar back if you are worried. It shouldn’t impact the outcome. I haven’t tried cutting back the sugar so you’ll have to experiment a bit. Good luck! Just made these…I know…. a little late to the party. Used whole wheat pastry flour, sucanat ( 1.5 cups ) instead of both sugars, unsweetened coconut and quick cooking oatmeal ( just didn’t blend it). I mixed the eggs and sugar together first to “melt” the sucanat, then added the butter. They were tough to mix at the end, but came out delicious, even my 11yo’s suspicious friend really liked them. Just made these cookies today! I put the cookie dough in the fridge for 1 hours. Just made these cookies today! I put the cookie dough in the fridge for 1 hour. Sorry….just flipped to the newer comments and saw the post regarding coconut…. Hi Tyler – do you have a blender? You could try lightly pulsing the mixture in that. Just wondering…..didn’t see anything browsing through the comments, but are you using sweetened or unsweetened coconut for the recipe? Also, if don’t have a food processor…….what can you suggest?? Love, Love, Love these cookies! Made a tray of them for the office for Valentine’s Day. They were gone with a blink of any eye. Made them again last night for a take home treat for “The Girl’s”. This recipe is a keeper for me! Thanks again for sharing. These are AMAZING!!!!!! Making them again today for the second time on a week! Kids loved them too even with oatmeal and coconut…they had no clue! They are just delicious! I just made these, and they are delicious! Turned out perfectly, even though I only had light brown sugar. I made these today and it is a keeper! Thank you for sharing. Coconut is an ingredient that I have only recently began to like (it is more of a texture thing..not necessarily the taste) so I throw the coconut into the food processor and chop it rather finely. Will have to see if my husband and son say anything about them…they are definitely in the no coconut camp! THESE. ARE. AWESOME. It’s a freezing cold “snow day” here in MN, so we made cookies. I didn’t have quite enough flour, so I substituted half with white whole wheat. I also didn’t have enough butter (no running to the store when it’s -42 below!) so I substituted half with coconut oil. They are SO GOOD. Our new favorite cookie! Thanks for sharing this fabulous recipe! Can’t wait to make these cookies for New Years Eve!!! or maybe tonite. ha ha. What kind of flour did you use? Do you have a favorite brand, King Arthur etc….also, what kind of coconut did you use, package??? in a can?? does it matter?? Thank you! Love your recipes!! Nancy – I always use unbleached all-purpose flour (either Gold Medal brand or Dakota brand; mostly because that’s all I can find in my area). I used sweetened shredded coconut in a package that is found in the baking aisle. Good luck! I made these today and almost loved them. My cookies had a bitter taste to them. I think it was the Dark Brown sugar. Has anybody made these with just light brown sugar. I really enjoyed the taste minus the bitterness. I measured the dark sugar correctly so what did I do wrong? I have made at least one different chocolate chip cookie recipe every month this year, and it took until now to find the best one! Seriously, perfect texture and flavor. I used half dark chocolate chips and half milk chocolate, but otherwise followed the recipe exactly. Thank you!!! This recipe is a keeper for sure. Do any changes need to be made if I were to sub raisins for chocolate chips? Hubby is a huge raisin fun. Thanks so much!! Jackie – I’ve never tried it adding raisins so you’ll have to experiment. Good luck! Hi Mel! After you add the eggs, etc., do you need to beat the batter a bit to incorporate, prior to adding dry ingredients? I hadn’t made these in a long time and they were a flop, so I need to figure out where I went wrong. I know they are delish! Hi Lori – I hope these work for you! I always beat the cookie batter with the eggs (before adding dry ingredients) for 3-5 minutes until it is really light and fluffy. What happened last time you made them? Did they spread too much? Why yes, they are now my favorite cookie!!! The chewiest,fudgiest,yummiest ever!!! Hi Mel, do you know if I can use all dark brown sugar? I see a few people mention using all light brown with success, but not dark. Thanks! Lori, yes you can. It makes the cookies slightly more dark and rich but will still work. Hi Mel, do you know if I can use all dark brown sugar? I see a few people mention using all light brown with success, but not dark. Hajrija – unfortunately these cookies really need the brown sugar to work out. Mel, I have a confession: I am one of your closet readers. I have enjoyed making many of your recipes, and for that I am so grateful!! I am not a very good cook (which is why your blog has been so helpful), but I LOVE to bake! These cookies are so good – I made them today and already ate 4 of them. I used only light brown sugar, since that’s what I had on hand, and they turned out phenomenal! So chewy and so delicious. My husband LOVES coconut and I love chocolate. So pairing the two together is just the greatest! Thanks again for all your wonderful recipes. Confession: I have eaten far too many of these in the last 24 hours since making them. It’s just that I really needed a lot of samples to determine whether they are better warm from the oven or cooled down (and yet I still don’t know definitively . . .). So much chocolate, and the right amount of saltiness and chewiness with the oats and coconut. Thanks for sharing. Trina – I use both unsweetened and sweetened coconut in this cookie recipe and both work great (just depends what I have open in my pantry/freezer at that point in time). And yes, I know dear Martha and many other gourmet foodies recommend unsalted butter but I have to confess that I don’t use it. I use regular, salted butter because it’s just always what I buy and have in my fridge. You can definitely use unsalted butter – just add a little more salt to taste. Mel, can you clarify what type of coconut you use? I only buy unsweetened ones. I’m going to give these a try. Is it wrong to have more than one type of your cookies in the house at the same time? Just made your delicious sugar cookies last night and am off to the store to collect the loot for these. Ohhh how I love winter! (Ok….so we make alot in the summer also but who is counting) Thanks again for all the yumminess! Megan – I’ve never tried adding coconut extract. Let me know if you try it! I definitely don’t think it would ruin the cookies – it would probably enhance the coconut flavor. I love these cookies warm from the oven, cooled after a few hours and the next day (by the 3rd day they are a little crumbly). I haven’t really noticed when they fare the best (1st day versus 2nd day) because I love them either time! Mel, have you ever tried adding a little coconut extract? I love coconut and I used to make a recipe from allrecipes that was similar, but no oats, and I loved the addition of coconut extract. Have you ever had the coconut chocolate chip cookie from paradise bakery? Oh, it’s divine. I am making these this week and wanted your 2 cents on the extract. I can’t wait….not that I need more calories after Halloween. Tara – I’ve used both with delicious results. Sweetened is a bit easier to find but I like the heartiness of the unsweetened. Of course it makes the cookies a tad less sweet but there is a plethora of sugar in the recipe to make up for it. I can’t believe no one’s asked…sweetened or unsweetened coconut? I made this today but replaced the coconut with toffee chips and toasted crushed pecans and they were amazing! Thanks! The cookies came out pretty flat, but they still taste super good! I really think the two different brown sugars make a big difference on flavor. I guess I could always refrigerate the dough after mixing too if my butter was too soft. Anyway, thanks for the help and your recipes are outta this world! So what kind of consistency am I looking for in this dough? I noticed that when I followed the directions it seemed wetter or stickier than most cookie doughs I’ve worked with before. They really flattened out as they cooked too, maybe my butter was too warm? Room temp in St George Utah can be near 80 even with A/C! Aaron – I’m guessing your butter might be too soft. The consistency of these cookies isn’t unique – it should be similar to a regular cookie dough. Stiff enough to roll into balls (leaving a slight residue on your hands) without being overfloured. The butter should be soft enough to gently press a finger into and leave a divot but if you are able to slide your finger through all the way to the counter through the stick of butter with no problem – well, the butter is probably too soft and can cause the cookies to flatten. If elevation is a factor (I have no idea what the elevation is in St. George), as in, high elevation, you might also try adding another 1/4 cup of flour to the dough. Hope that helps! Sarah – sorry for the delay in responding. I am just returning from vacation. But to answer your question, I use salted butter. I’m going to make these for my friend tomorrow since she’s been helping me lots lately. So hopefully they turn out well and she and her family enjoys them. Just a quick question, should I use salted or unsalted butter? Thanks! Your blog is now my ‘go-to’ food site too. I am still discovering wonderful recipes like this one. I do have a suggestion that is helpful if I want to excercise a bit of control and not eat them all too quickly. **Here is a great tip I learned from my Mom; Mother of 12 grown children, always made (still does, actually) double batches of cookies. She makes dough ‘logs’ about 12 cookies worth, wraps them and puts them into freezer bags! I dont always have time or patience to bake a whole batch, so I slice off six or so for a quick treat! These are delicious! I love the flavor that the dark brown sugar adds. Plus, they’re super chocolately! I’m curious though…my cookies look much darker than the cookies in your picture. They almost look like I used whole wheat flour (which I didn’t) or a little cocoa powder (which I didn’t). They cooked perfectly and tasted so good. I was just curious about the color. What do you think? Oh, and I used exactly 1/2 cup of dark brown sugar. Maybe I packed too much into the measuring cup? Joyce – I’m glad you loved these! To be honest, I have no idea why they would have been so much darker, unless my picture is just deceiving. They turn out fairly dark when I make them, also. This is a delicious recipe! I added white chocolate chips and craisins instead of the chocolate chips and it turned out great! Thanks so much for sharing such consistently great recipes. Made these last night! Doubled it actually. I was at the oven for hours!! Now I have a bunch to share and freeze! Great recipe! We loved them!!! Making these late tonight for a cookie bake-off contest at work tomorrow (hoping your recipe brings me luck)! I read the posts above from Anonymous who mentioned her cookies didn’t spread out. Mine didn’t spread as much as I would’ve liked either. First, I thought it was an altitude thing, but now I think my butter was a bit on the cooler side of room temp. So, I really think that’s the trick because I measured my flour with the dip & sweep method. I will make sure my butter is softer next time, but let’s face it they smell and look delicious – we’re really splitting hairs at this point. Can’t wait until the first ones cool to try them. Thanks for all the great recipes! Oh, also wondering if you have any dry ingredient storage container tips aside from using the paper bags flour & sugar are sold in (possible blog idea?). Holy guacamole, woman. These cookies are like crack, seriously. I’ve already eaten a week’s worth and I only just took the last batch out of the oven! Thank you for another AWESOME recipe! We LOVE these cookies. I have made them several times already! Thanks for sharing. I continue to enjoy EVERY recipe from your site. Made these tonight and they came out great! I only used about 6oz of chcocolate chips, a teaspoon of baking powder instead of baking soda cuz i didnt have any and only used 1 1/2 cup of sugar. Next time i will plan ahead and make sure i have all the right stuff though. I’m sure they will turn out even better! ok – thanks! Love your site! Do you have a printable version for these??? Karen – I haven’t added printable links to all the recipes on the site yet. Hopefully this one will be soon! I made these yesterday (in addition to the chicken gyros and soft wrap bread…I was busy in the kitchen yesterday!) and they are perfect!! I left out the coconut, only because I didn’t have any on hand and didn’t want to go to the store..but they were still delicious. The only thing I noticed, is that I ended up with A LOT more than 2 dozen..I had a little less than 4 dozen. Maybe I am making my cookies too small? But they seem average size to me. But thats just fine, because I can throw some in the freezer and I have plenty to eat over the next few weeks! Kimiko – yes, you were busy! I wish you could come be busy in MY kitchen for me! Glad you liked these cookies – and the end count is probably a result of size. I think I make my cookies overly large! Anonymous – I use my scale anytime a recipe states the ingredients in both cup measures and in weight. If it gives the option to weigh, I always weigh the ingredients. I’m sure you’ll still get a lot of use out of your scale! Made these today. My husband will not go into the kitchen tonight because he can’t stay out of them. They are very good. Chewy and moist. YUM! Also, I previously asked about caramels and my four attempts. I finally have mastered it! Have made two successful batches now. Woohoo. Julie – well, first, I am so glad these cookies have been a hit! And second, yay!!! on your caramels. I am so, so glad. Good for you for mastering them and thanks for letting me know! Anonymous – I’ve been wondering if you dared to make these again and I’m glad they turned out a little better for you! Thanks for letting me know. Anonymous – usually a scale is a great thing to use to measure ingredients; however it probably doesn’t work so well on recipes that weren’t created and written by measuring the ingredients by weight. This recipe was written based on cup measurements so it could be tricky weighing them and I think you are right, it probably was an issue of too much flour. A cup of flour in a recipe can weigh anywhere from 4 1/2 ounces to 5 ounces. That’s a pretty big difference so there isn’t a good way (in my opinion) to convert recipes like this to weight without testing them over and over. The safest way would be to use the scoop and level method to measure your flour and other dry ingredients in the cups. Good luck! Your the only one who mentioned the flour, and I think your right! I am pretty sure my conversion was incorrect. I bet that was the issue. Is there an online source you use for coversions? How many ounces of flour should I have used for this recipe? My co-workers are still saying the cookies were delish (unless they are lying..lol) so thats all that matters but I’m determined to get them right the next time. Hi Melanie, I used my scale to measure the flour, not sure if that is a good or bad thing? I thought it would help but now that you mentioned it, none of my cookies spread (I made 3 types)so maybe that could be it, too much flour? Am I better off scooping the flour into a measuring cup? How long should I keep the butter out? Anonymous – hmmm…usually the problem is that cookies overspread because the butter is too soft (almost melted) so it would seem to me that maybe your butter was too cold. Was it at room temperature when you made the cookies? The other issue may be too much flour. Everyone measures flour differently so if you think you may have a heavy hand measuring the flour (i.e. scooping the flour and shaking the cup to level it which means the flour settles and there is more flour in the cup than if it was lightly scooped and leveled off with a knife) that may be the issue with them not spreading. I hope that helps! Let me know if you have any other questions. I made these over the w/e and they were delish! Only problem is they did not spread and I am sure it was something I did (I’m no pro). Any ideas? After adding sugar, eggs and vanilla, do you mix for a while before adding the dry ingredients or add all at once? How long do you keep the butter out for room temp? I want to make these again soon but I hate when they don’t spread and look like “real” cookies! Good, b/c I bought the HUGE box at Costco by accident…thinking they were the quick oats! Lorie – yes, these taste best with the old-fashioned oats (in my opinion, at least). Hi Melanie, so just to be clear, I need the old fashioned oats for these, is that correct? My Sister’s Kitchen – I saw your post on these and I’m so glad you liked them! I laid out recipes/requests for my husband for Mother’s Day, too. 🙂 Hope you have a great one. Does it really make a difference if you use quick cooking oats or not? Why the light and dark brown sugars? Can I just use light for the whole thing? I’m just wondering if you’ve ever tried any variation in these areas, and if it affected the cookie. I want it to be my favorite cookie too! So, I’ll go to the store to get dark brown sugar and regular oats if I have to, but – also having 4 kids – if I don’t have to, that would be great! I’m making these cookies TODAY, and no one can stop me. Must have them! Queen B. – I’ll pass on your good tidings to my Aunt Marilyn. She’ll be glad to know she’s loved. 🙂 I’m very, very glad you liked these cookies! I’ve never met a chocolate cookie I didn’t like so I can invite you but you might just get the crumbs. These are almost identical to my mom’s famous cookies — she uses shortening instead of butter. Even more fatty goodness. Seriously, I get raves every time I make these (well, my mom’s version, but I’m guessing these taste almost the exact same). These are great cookies. Hands down the winner of all cookies. I’m with you on that one. Mmmmm. Chewy with a little bit of crunch. Delicious. I made these this weekend. They were an absolutle HIT. I absolutely LOVED these cookies. I thought that maybe if I put half of the double batch I made in the freezer they might last longer! Unfortunately I found myself with the same problem as you! I grabbed 4 cookies from the freezer nearly everytime I walked past! The funny thing is, I don’t usually like cookies. These have been ranked as life changing!!! These are wonderfully bad I just ate three for breakfast. I made them with all whole wheat flour and they were still fabulous. Thanks so much for your blog my husband and children thank you too. I’ve been reading your blog for a while now. And each time I do the same thought comes to my mind. “What is your problem. . ., and Why are you doing this to me?” I realize that you don’t even know me and that you are not out to secretly make me fat, but I have so little self control that just looking at your pictures makes me drool. To be honest I’ve never tried any of your recipes, but it’s only because I know once I bake it I’ll gobble it up right away. Having said that your black and white cheesecake squares recipe and your lemon sugar crusted blueberry muffin recipes are taunting me! I think I need professional help! You keep posting and I’ll work on some self control! These look great! These will be the next cookie I make. houseofdrama – I guess wonderfully bad is a good thing, right? Glad to know whole wheat flour worked great in the recipe. Thanks! These are definetly good looking cookies, and I bet they are seriuosly good! I’m bookmarking these!! Queen B. – well you are officially the nicest person ever! Thank you for your comment. It really, really made my day. It is high praise and I’m not sure I am worthy of it but I sure appreciate it. I definitely look forward to getting your comments. They ALWAYS make me smile! I have to agree with Queen B. I am amazed at your recipes, it has been so fun trying and looking at your recipes! Thanks! Made these today with the leftover coconut from the Somoa bars. They were great. I’ve already given my husband specific requests for Mother’s Day–the bean dip with shoepeg corn and the Lemon Cake. Yum. I can’t wait. Your blog is my most favorite food blog! We must have the same taste because everything you post, I print! Thanks! Kewl Granny of Six – hey, I’ll take the crumbs!! I’m like you, I’ve never met a chocolate cookie I didn’t like either! Amelia – valid questions on the cookie. I definitely think dark brown sugar over light brown sugar is key here – dark brown sugar gives it more depth of flavor and more chewiness (in my opinion). Also, quick cooking oats can be substituted, but be careful not to blend them up too much in that step – that’s the reason for the cooking oats because they don’t get ground as finely when all the dry ingredients go in the blender. 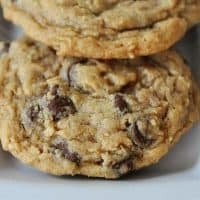 I’m always one for finding substitutions, so don’t be worried about substituting the light brown sugar and quick oats – the cookies might be slightly different in texture and taste but I bet they’ll still be delicious (and seriously, I’m all about NO extra trips to the store with four kidlets in tow). Yum, yum – nothing better than a good chocolate chip cookie. I will be one of those people leaving the coconut out – thanks for sharing! Jonelle – well thanks for that compliment!! I appreciate it (and am glad you liked the recipe, as a sidenote). Everyone is so nice – I definitely don’t deserve it! Kara – glad you liked these and thanks for letting me know they still tasted great with the light brown sugar! Please know that I used to be a epicurious.com and foodtv.com girl……ONLY. Until I discovered MY KITCHEN CAFE. Let me tell you…….I LOVE TO COOK……and only like the BEST RECIPES……..I collect cookbooks……and I KNOW GREAT RECIPES when I see them. Well, I AM HERE TO ANNOUNCE THAT MY KITCHEN CAFE is my all time favorite food blog….ever. I have four children and I KNOW how hard it is to blog……….. I am a cookie fanatic too, so I’m not going to be able to resist making these for very long, they look amazing! I am a HUGE coconut fan, in fact, I like coconut more than chocolate chip cookies! Together it sounds like a winning combination. I might be tempted to add crystallized ginger to this recipe when I try it… mmm! I love chewy cookies, they’re the best kind imo. Yum! I made these for Teacher Appreciation Day today, and they are terrific! I know the teachers will love them as much as I do! Thanks! I tried these cookies last weekend and they were gone in one day. My hubby called them life changing! They were amazing!! I love the texture of this cookie it really is the best cookie that I have found! Thanks for sharing!! Samantha – let me just tell you that I feel an instant kinship with people who love this cookie just as much as I do. It really is one of the best cookies ever. Thanks for letting me know you loved it, too. Thanks for curbing a baking craving! I “tried” these cookies today and they were really good! I say “tried” though because I made a bunch of substitutions based on what I had at home. Someday I will try the real thing. But, just so you know, if you make these with home-ground oat flour instead of processed oats, whole wheat pastry flour instead of white, sucanat instead of either brown sugar, and cinnamon chips instead of chocolate, they are still delicious. Candace – I’m so impressed with the changes you made – it makes the cookie seem so…so…well, so healthy! It’s like a whole different cookie. Thanks for letting me know!